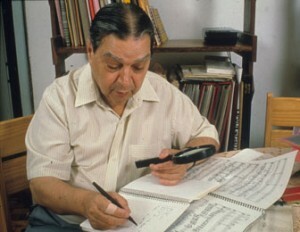 César Guerra-Peixe was a Brazilian violinist, composer, and conductor. Born in Petrópolis, son of Portuguese immigrants with Romani origins. His music can be heard in many Brazilian films, such as Terra é Sempre Terra, O Canto do Mar, Quero Essa Mulher Tanto Assim, Riacho de Sangue, Meu Nome é Lampião, and Soledade. In 1965 Guerra Peixe won the Medalha do Mérito Carlos Gomes, bestowed by the Guanabara State government, in recognition of his dedication to developing Brazilian culture. During his late years he worked as professor at Universidade Federal de Minas Gerais where he helped to form a new generation of Brazilian arrangers. As an ethnomusicologist, he wrote an important book Os Maracatus do Recife (1955, second edition 1980) on Maracatu. He died in Rio de Janeiro.. He was the son of Portuguese parents that were born in Beira and came to Brazil in 1893. His father worked at the traditional trade of horseshoer. An amateur musician, he played the following folk instruments: guitar, mandolin, Portuguese guitar, eight-bass button accordion and zither. The youngest of ten children, at six César Guerra-Peixe’s father taught him to play some guitar; at seven he taught himself to play mandolin; at eight, violin; at nine, piano. And so began the story of a great Brazilian composer.